Apes Hill Club is one of the newest championship golf courses in the Caribbean. 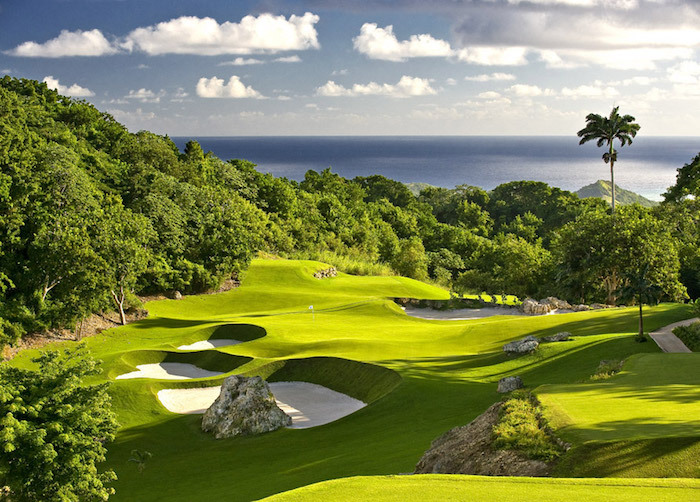 Enjoying a prime location at almost 1000 feet above sea level in the centre of Barbados, and with lush grassland, coral stone quarries, wooded ravines and sparkling lakes, the course is as much in accord with its natural surroundings as it is an exciting challenge for golfers. Multiple tees, elevated to showcase the breathtaking west and east cast views, allow players of all capabilities equal opportunity for a satisfying game. The top quality layout of the 7150 yards, par-72 course has been implemented with tremendous regard to the full range of strategies that players need to adopt when facing each hole. As would be expected at a venue of such high aspirations, the course is maintained in immaculate condition. The golf course was recently rated one of the best in the world and has gained international recognition as a Certified Audubon Cooperative Sanctuary for its environmental and wildlife preservation efforts, thus becoming one of only 2% of all golf courses in the world to earn such certification. Although golf membership is reserved only for property owners at Apes Hill Club, there are a limited amount of guest fees available for others to enjoy the course. There are excellent practice facilities, where high-quality practice balls stacked in pyramids await your arrival on freshly cut lush paspalum grass. If you are traveling light, premium hire clubs and shoes are available upon request.